I consider myself some what of a hair chameleon. I like to switch it up and stay fresh. For a couple of months now, I've been wanting to cut bangs, however, I've been a little hesitant to do so. I have post traumatic thoughts of my childhood bangs...you know the kind, cut unevenly in the first quarter of your forehead, or set with a hot roller and finished off with a half a bottle of hair spray...I could still get passed it. Think Jessica Biel, Kate Moss, and Zoe Deschanel. Thicker blunt cut bangs have a certain stylish appeal about them. They are trendy, but always classic. Cool, but not always popular. Daring without trying too hard, and serve as the perfect frame to show off your eyes. Double and, they look killer with a top knot. I've tried the clip in's, you can see my post on those here, but it just didn't do the trick; I wanted something more permanent. So, on Saturday, I somewhat impulsively, had them cut. If I have an idea in my mind, it usually doesn't go away until I try it. The blunt cut bangs are taking some time to get used to. But slowly, they are starting to feel more and more like me! What do you think, would you ever try this style? Most.Perfect.Bangs.Ever! They look so chic and make your eyes look amazing! Bangs look good on you! They can be such a hit or miss on some other people! they look great on you! I have had bangs, and not had bangs..and every time i cut bangs, i instantly regret the decision because i then remember how much i hate having something in my face, and with bangs i always feel like pinning them back (yikes). So ive told myself i wont have bangs again. we will see how long that lasts. They look great! I love bangs. I pretty much get them every year. I'm not great about keeping up with them... so I get them cut, they grow out, I decide I want them again and get them cut again... and the cycle continues. I hope you enjoy them. I think they're so fun and they look great on you. ps they call bangs "fringe" in the UK. Well if anyone call pull it off it's definitely you! You look great, your eyes just pop! You look awesome with them! I got mine cut a couple months ago and now regret it. SO much up-keep! you look great, i love the bangs!! Looks gorgeous! I want deets on that outfit though!! The bangs look fabulous! I wish I could pull this look off! I have to say, you pull off bangs flawlessly. But then again, you pull of almost anything flawlessly. I especially love them, though, for the fall weather. There's something chic and just.. warm about them! Great look. I love your bangs! They look fantastic on you! I had fairly blunt bangs in 2008 when they made their way back into style and I grew them out not long after. I can't say I would never do it again, but it's not in the near future! I always fall victim to trying bangs every few years or so. But i always end up growing them out which is plain! looking forward to see how you rock them! I just cut bangs too! Love the look on you! Wow, you look so different! But in a good way :) I like it! GORGEOUS. i had the same itch to get bangs about 4 years ago...right after i got married. my husband HATED them on me. but mostly because i had them pinned back 90% of the time. now seeing you makes me want bangs again!!! love the bangs! work it girl!!! I'm in agreement with everyone else! They look lovely! Way to be daring and just go for it! I am so glad I cut my bangs about a year and a half ago. I can't imagine life without them. But yes, they look great! I'm glad you took the risk! Aw, i love your new hair cut! Personally, I am a big fan of bangs I love being able to sweep it to the side or just keeping them straight down! Your bangs are gorgeous! You are so pretty I bet you could pull anything off! I cannot unfortunately. You look great lady :)! They look amazing on you and frame your beautiful face so well...love! These look adorable on you! Plus, you know enough fun ways to do your hair that if you aren't feeling them for a day or two, you can always twist 'em, braid 'em, etc. They really do look great! Those are awesome! I've been thinking about going back to full bangs...I've been rocking the side bangs for a while now and like you I need a change. Could I ask who you had do them? That's been my other big hesitation... I haven't found someone I trust in the valley just yet. Thanks! You look great with bangs! They really make your eyes stand out! I am of the belief that everyone looks better with bangs! You look amazing in bangs ! I think this style looks GREAT on you! I've been debating about getting them lately, but I think I'm sticking with side-swept for now. lovely! and would you believe that last week i took the bang plunge too?! Love the bangs!!! You always look amazing! I cut mine the last time the trend went around and I did love them! They''ve finally grown out now I'm trying to convince myself to adore them on everyone else instead, lol! I've been following your blog for a bit and it's crazy how similar we are when it comes to hair! I get bored so easily like you do and when I get something in my head I have to do it and right now! I too just got bangs 2 weeks ago. I like them and they are fun, but already I'm secretly wishing they would grow! Yours look fantastic by the way! They look great on you!! Oh my gosh I LOVE them! 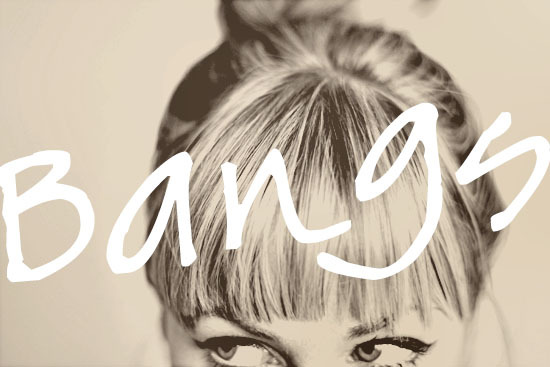 Seriously that bang type is PERFECT for your face! OK. So I rarely post a comment but had to here. I, like you, love to change it up when it comes to my hair. Usually, I end up hating it. That said, bangs are my favorite but because my hair is so coarse they are hard to maintain. Yours are FAB Katie! Like Reese Witherspoon perfection. LOVE. They look great! Way to go! i cut blunt bangs like that when i was about 25 years old and this woman at work said "dont' worry honey, they will grow back out !" Love your new hair. It looks gorgeous. It's amazing how much giving yourself bangs can change up your looks. Love, love, love your outfit. Gorgeous pants. I totally agree about the change room. YOu have 90% committed to what you are buying once you get into the dressing rooms. Love those bangs! Look great on you!! I have this tendency to grow my bangs out, cut them, grow them out and so on and so forth. I do love the way they make one's eye's pop. You look great! So cute! They look very sophisticated and playful on you. Wish my crazy cowlick would let me have some similar!